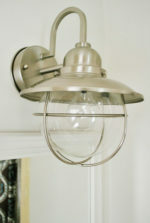 Generally speaking, the most expensive home interior makeovers are those undertaken in the kitchens and bathrooms. This is largely due to the cost of appliances (in the case of the kitchen) and the large number of fixtures in the bathroom, including tubs, showers, toilets and sinks. That’s before you consider any required changes to the plumbing of either room. Sometimes it isn’t necessary to rip everything out and start from scratch when undertaking a renovation. This can be especially true in the case of making over a bathroom. And if you shop around, do your homework and don’t mind a little legwork, you can also save a fortune. Jessica’s home was one of those outmoded 80s nightmares—the bones are good, but some of the design choices in rooms like the baths, had completely dated the home. 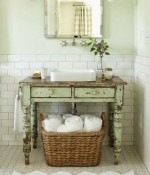 Jessica concentrated on one element, the bathroom vanity and transformed the entire room—practically for pennies. Jessica started her vanity renovation by painting the oak cabinet with slightly watered down chalk paint which makes it easier to apply. Other than cleaning the surfaces to be painted, Jessica did no other prep, other than to mask off the vanity counter and floor. Two coats of paint covered the oak finish beautifully, she topped off by applying 2 coats of water-based polycrylic to seal and add shine to the finished paint job. The original grain of the oak still shows through, adding texture and visual interest to the final effect. 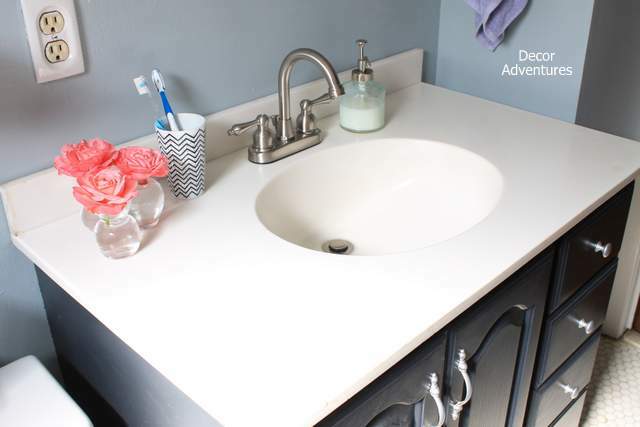 The vanity’s other main feature was a shell sink and countertop combination, which was all the rage back in the day, but which now is not only outdated but borderline ugly. Worse, it sported a garish gold faucet! 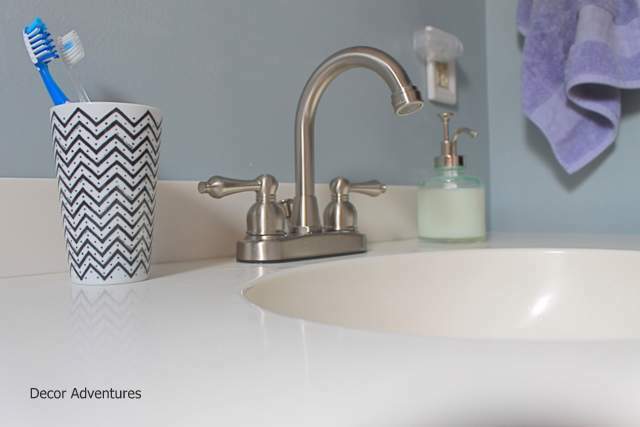 Bathroom sinks can cost as much as $200 and sometimes more, depending on materials and styling. Jessica had an ace up her sleeve however; she knew about sources that most of us don’t: architectural salvage and thrift/reuse stores! 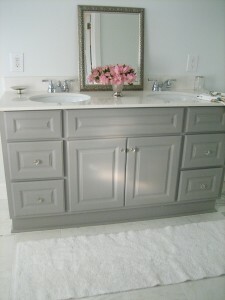 Rather than shell out big bucks for a brand new vanity sink, she found one for $15 dollars in the right color and size. The beauty of shopping for a sink in these types of shops is that there are all sorts of options available. And many have been gently used and need nothing more than a thorough cleaning before installation. Our intrepid DIYer placed and caulked the sink into place herself. 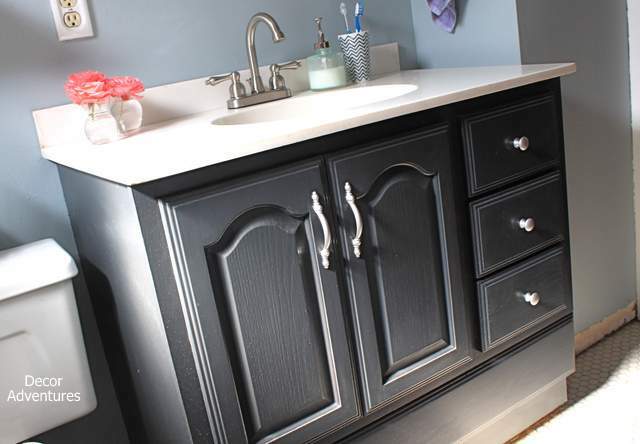 This bathroom vanity makeover was made complete by the purchase of a new faucet and drain assembly; sourced online for less than 50 dollars; she spray painted the vanity door handles and drawer pulls a brushed satin nickel finish to match the fixture. 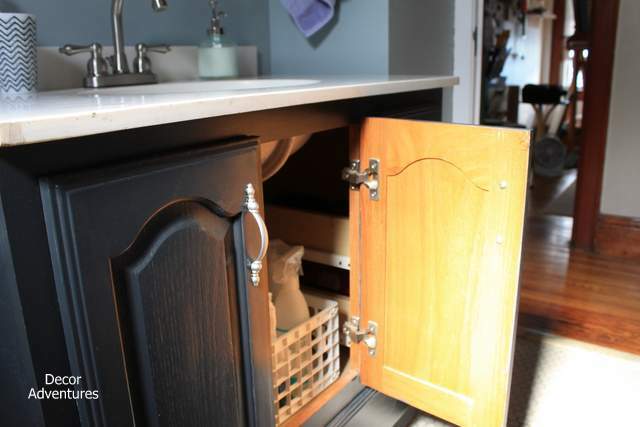 The cost for this vanity renovation? 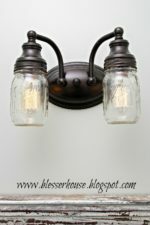 All of $93 dollars—and there was enough paint left over to use on several other projects in her home! 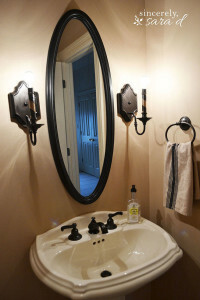 Please share your bathroom vanity makeover ideas with us by submitting your remodeling project today.